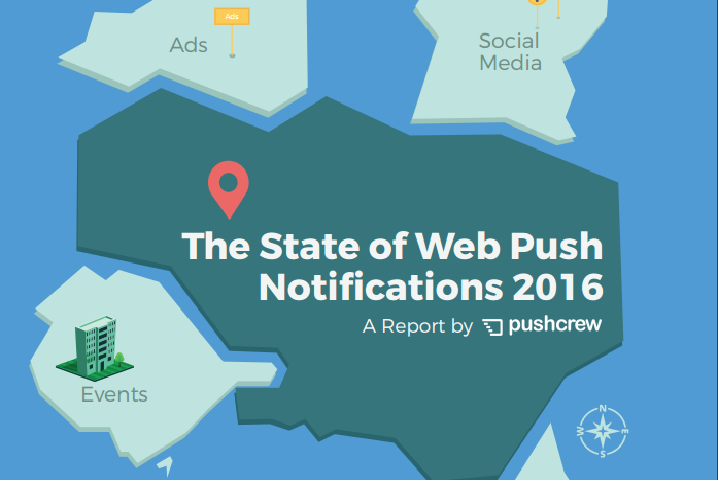 PushCrew released the world’s first report on web push notifications for marketers. Though web push notifications are not a new concept by any means, lack of research on the technology makes it very tough to understand for mobile-centric app marketers. 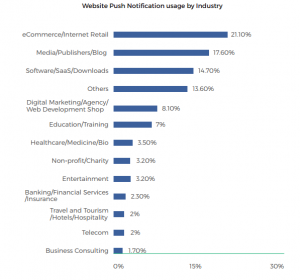 The report titled ‘State of Web Push Notifications in 2016’ provides a detailed insight into how web push notifications are used across domains like e-commerce, blogging, and SaaS. More than 60% push notification users are small-sized organizations. 21% of them belong to the e-commerce category. 51% of the respondents use push notifications for e-commerce related activities like sending discount coupons, announcing new products and delivering personalized promotions. Average CTR for web push notifications sent to at least 5000 subscribers is 10.85% compared to 3-4% registered by emails. 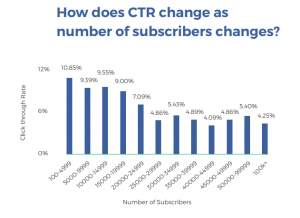 Click rate hovers around 4-6% even when subscriber number crosses 25,000. Wednesday is the best day to run a push notification campaign. Average CTR on Wednesday is 6.21%. CTR decreases significantly when an extra push notification is sent daily. The biggest hurdle marketers experience in push notifications is the ambiguity in customer behavior analytics. Close to 30% respondents believe that push notifications cause irritation to users, forcing them to leave the website. 19.53% respondents consider push notifications as a spamming medium for users. 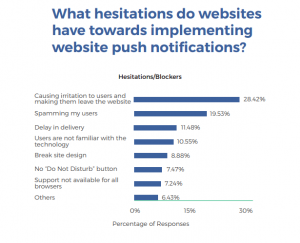 DND and non-supportive websites are other challenges that force marketers to abandon web push notification campaigns. PushCrew, launched by Wingify in 2015, enables marketers to send push notifications to customers via web browsers. Wingify, the leading website optimization technology solutions provider, provides Visual Website Optimizer, a conversion rate optimization (CRO) tool that helps its clients improve sales and lead generation via their websites. Wingify acquired web analytics platform Navilytics in November 2015, offering marketers a wide-range of stats related to user’s click behavior and tactile actions to strengthen retargeting campaigns. Gaining ground over the last couple of years, marketers use web push notifications as an effective medium to communicate with customers across online and offline channels. Web push notifications are clickable messages, similar to app push notifications that websites send to their users on desktop and mobile browsers. Considered as the asynchronous web delivery platform, the web push notifications were largely a part of web-enable apps working on Notifications APIs, Push APIs and other HTML APIs. Now, they are part of most mobile marketing and e-commerce campaigns. As mobile app inventories take the high route to marketing budgets, push notifications can ensure higher audience reach without forcing users to download an app. PushCrew’s latest report is a strong evidence highlighting the importance of push notifications in in-app messaging and B2B pp campaigns.